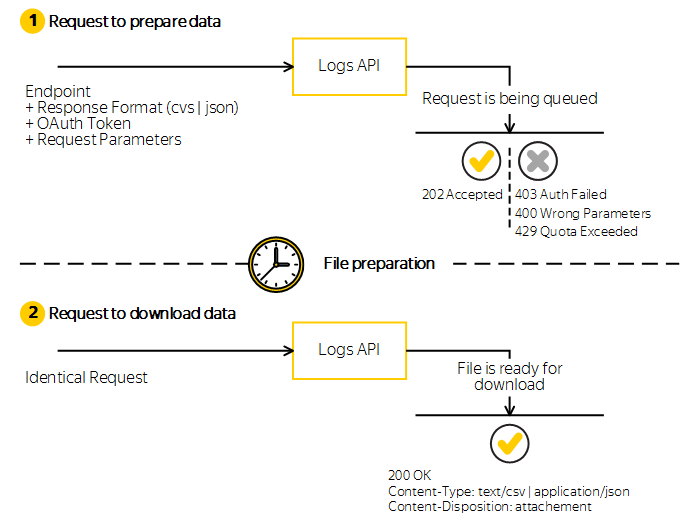 The AppMetrica Logs API accepts the request and puts it in the queue. If the request is processed successfully, AppMetrica prepares a file for download. In this case, the API returns the HTTP 202 Accepted status. If the request resulted in an error, the API returns the appropriate response status, and the HTTP message body contains the error description. While the request is being processed and the file is being prepared, all identical requests (with the same parameters) will return the HTTP 202 Accepted status. To get compressed data, send the HTTP Accept-Encoding:: gzip header. The request to download data is identical to the request to prepare data. If the request to prepare the file is complete, for the next identical request, the Logs API returns the 200 OK status. The results file is ready to be downloaded. For examples of response formats, see the section Response format. The file is available for download for 24 hours at the URL of the initial request. For a repeat request after 24 hours has passed, the request is put in the queue for processing and preparing a new file. To generate a new file, send the Cache-Control: no-cache header in the request. To download a file that was generated within the last N seconds, send the Cache-Control: max-age=N header in the request. If the file was created more than N seconds ago, AppMetrica generates a new file. To download the last generated file (if one exists), don't send the Cache-Control header in the request.